Paralympian Oscar Pistorius's dream of running in the Olympic Games at London 2012 has moved a step closer after the South African set a new personal best. 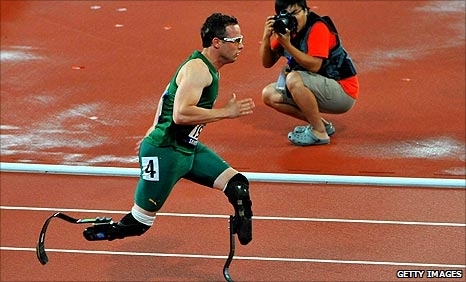 Double amputee Pistorius clocked 45.61 seconds on Wednesday in the 400m at the Provincial Championships in Pretoria. That time is just 0.06 seconds short of the 'A' standard needed for automatic Olympic qualification, should South Africa then grant him a 2012 place. "I need to put my head down and push for it [now]," said Pistorius. In 2008, the Court of Arbitration for Sport ruled in favour of the four-time Paralympic champion after a lengthy legal battle with the International Association of Athletics Federations over his carbon fibre prosthetic running blades. Pistorius was bidding to compete in the Beijing Olympics, but narrowly missed the qualifying time after clocking a best of 46.25 seconds. The 24-year-old, who will compete at the Paralympic World Cup in Manchester in May, was thrilled with his new best time. "I am delighted that my new personal best of 45.61 is within the Olympic B qualification and it takes me that step closer to competing in the Olympics as well as the Paralympics in 2012," he said. "It feels fantastic to have achieved a time that I knew I had in me and have been working towards for some time. "My main goal in 2011 is to qualify for the able-bodied World Athletics Championships in Daegu, and the Paralympic World Cup is a very important event in my preparation process." The 'B' standard that Pistorius has achieved is the back-up Olympic qualifying time, whereby competitors are sometimes called up to make an event competitive when there are not enough participants around the world who have qualified through the 'A' standard. 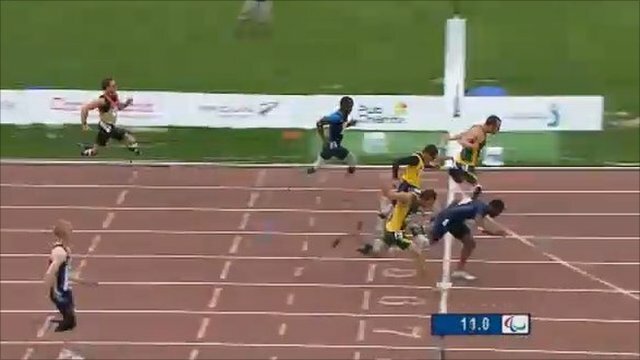 Pistorius suffered a surprise defeat in the 100m final at the IPC Paralympic Athletics World Championships in New Zealand in January, his first international loss in seven years over that distance. Swimmer Natalie du Toit took part in the 10-kilometre open water event at the 2008 Olympics before winning five Paralympic titles, while arm amputee table tennis ace Natalia Partyka played in both the Olympic and Paralympic competitions in 2008.